Some of the more technical routes in Colorado’s 14ers exist in the Elk Range. Castle Peak and Conundrum Peak are easier to scale and haven’t proven statistically likely for incidents, but Maroon Peak, North Maroon Peak, Pyramid Peak, Snowmass Mountain (the 14er not the ski area) and Capitol Peak have proven to be among the most treacherous for incidents and fatalities, Athearn said. Capitol Peak stands out among the Colorado 14ers because of the exposure near the mountaintop. He estimated the length of the Knife Edge at about 1/3 of a mile, but the distance isn’t the issue. It’s the exposure and the difficulty of crossing it. Ted Mahon, an Aspenite who has climbed and skied all the Colorado 14ers and accomplished various mountaineering feats in summer as well, said Capitol is just steep enough to put it in its own category. “It’s wrong to say Capitol is ‘fill-in-the-blank,'” Mahon said. Robson said many hikers leave Capitol to the end of their list of 14ers, with good reason. They should get experience in technical hiking before tackling Capitol and a handful of other peaks. Unfortunately, others try to hike it before they have the proper skills and experience. There’s pressure to tackle the 14ers. All of the hiking and climbing experts interviewed stressed that they were talking in general terms and not specific incidents, such as the fatal accident on Sunday. 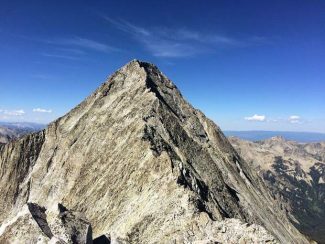 “They are a tick list and a magnet to those who want to climb 14ers,” Robson said of the Elk Mountains. “There’s definitely a summit fever that sets in. It’s real. Athearn said Colorado Fourteeners Initiative doesn’t have specific data on use of Capitol Peak. The nonprofit organization has placed people counters on some of Colorado’s highest mountains, but the U.S. Forest Service doesn’t allow the mechanized tools in wilderness, where most of the 14ers are located. “You can be armed with a high degree of technical knowledge, but once you’re standing on that Knife ridge, it all goes out the window,” he said. Athearn said hikers can take many steps to reduce the risk — go with someone experienced, go when the weather is favorable, pick your time carefully and accept if you have to turn around without bagging the peak. “A big part of it is humility and realizing these mountains are unforgiving,” he said. Glenwood Post Independent reporter Carla Jean Whitley contributed to this report.